A gradual transition using Canonical Mid Aubergine, indicating a Mix of consumer and enterprise focus. With the current design and the current placement of the bar, although many have said the orange clashes it would probably be the least different. A touch of Aubergine for a drop shadow? It should be interesting to see what they come up with, maybe a new design altogether? How about we really shake things up and make a Ubuntu Widget! 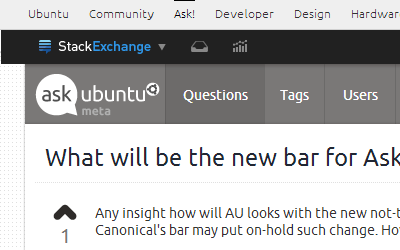 Giving quick links to all the sites available in the Ubuntu bar (maybe even limited updates to select sites). ^--- The StackExchange™ MultiCollider SuperDropdown™ takes precedence. 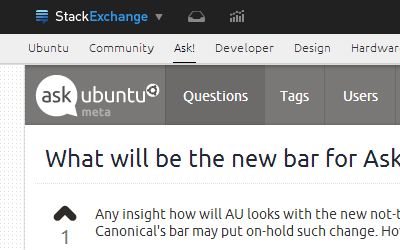 ^--- The Ubuntu bar takes precedence. Now that the new SE top bar is live it appears that the dark color does not quite fit to the otherwise so nicely made design of our page. Not the answer you're looking for? Browse other questions tagged support status-completed style . Are questions about how to upgrade to an Alpha release off-topic?